A distillation of the key elements within Terminal Frontiers, probing popular misconceptions and also suggesting alternative questions. 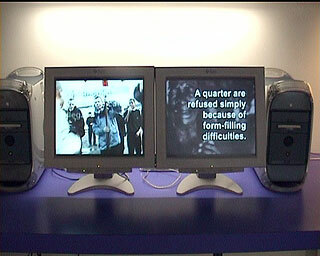 Comprising two electronic screens without sound, the left screen comprises a series of texts which ask open-ended questions relating to particular concepts explored by Terminal Frontiers, superimposed over relevant sequences either from specific works or created by local groups through workshops. 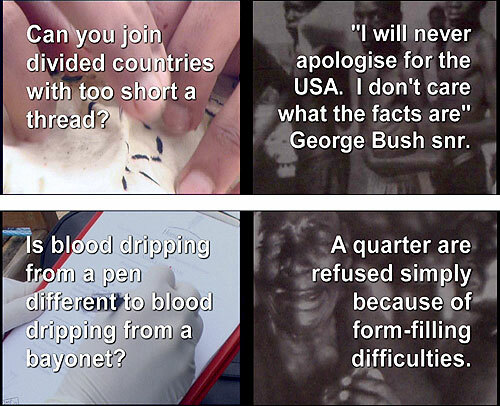 The right screen comprises a series of texts which simply give a selected assortment of information relating to asylum and globalisation, superimposed over subtly animated black-and-white news stills. The two looping sequences are of different lengths so that the left-right juxtapositions of questions and information continually change. The information on the right is not designed to answer the questions on the left, though there will always be any number of direct or indirect relationships between the two. Through watching the piece at different moments over time, the viewer is able to discover for themselves their own set of links, references and relationships through which to understand and explore the subject. This portable video installation that can be placed in a suitable enclosed community or public space also has a durable, lockable box with two windows for the screens, specifically designed for public areas and which creates its sense of temporary yet compact residence. The original localised ‘tour’ of Desti.Nation was the key subject of an extensive audience research project, the results of which will inform the way it will be used in future localities for Terminal Frontiers. Of particular interest will be ways of incorporating locally generated material into the work, wherever it tours to, so that it continually adapts to and reflects aspects of each locality of the wider tour. In this way it will evolve and by the end will have an identity borne out of its own particular migration.